One of the most eclectic cities in the world, Seoul is a beautiful mixture of modern and classical. One moment you could be walking past a thousand-year-old building and the next, be admiring the sophisticated design of a contemporary one. While there’s much to see and do in South Korea beyond Seoul, it’s hard to blame travellers for not venturing past the city. There’s no end to the number of exciting places to visit in Seoul irrespective of the duration of your stay. 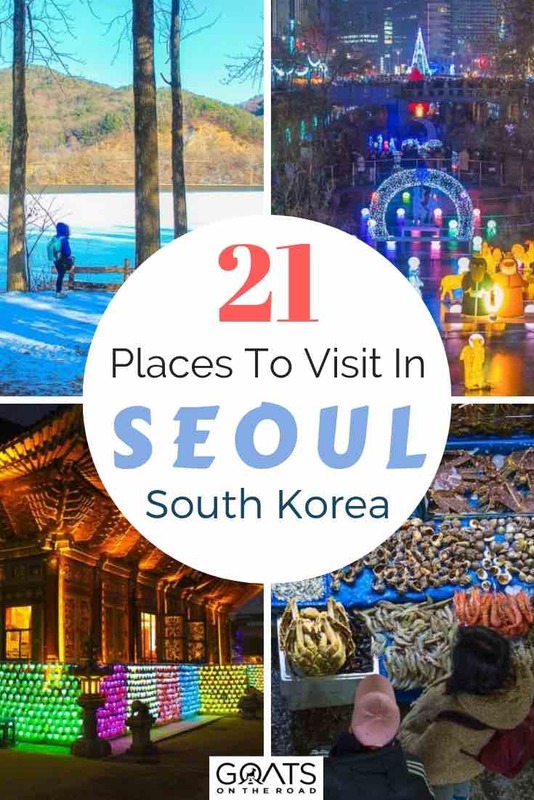 Whether you’re stopping by the city for 72 hours or spending an entire week, here is a list of 21 places to visit in Seoul that will have you falling madly in love with the city. One of the most buzzing places to visit in Seoul would be its markets that literally pop up every corner you turn. As far as real food goes, none compares itself to the atmospheric Gwangjang market, Korea’s oldest remaining daily market. The compact market hosts more than 5,000 shops and sees more than 50,000 visitors every day! 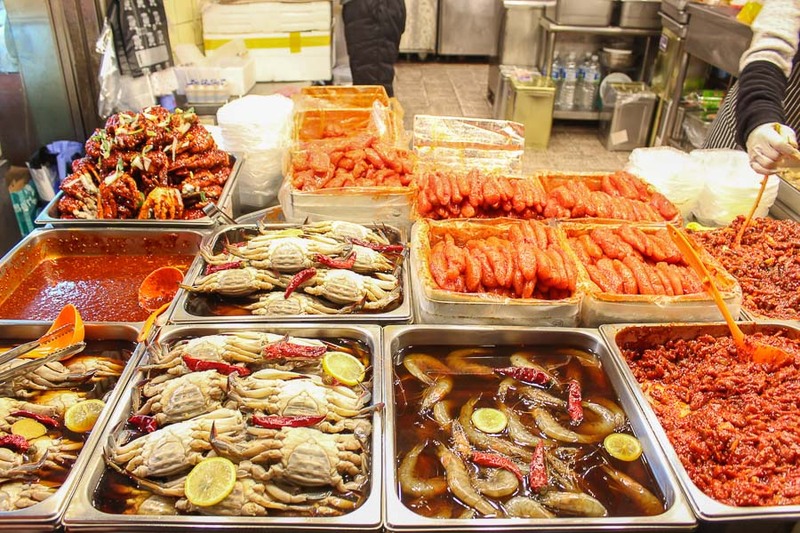 The market is most famous for shops selling bindaetteok (mung bean pancakes) along with sundae (sausage made of pig’s intestines), tteokbokki (rice cake), and jeon (an assortment of snacks). Wash them all down with a soju, sitting in the cramped tables lined along the shops. Close to the Hongik University, Hongdae is the neighbourhood to indulge in pubs, clubs, indie music, and arts. Featuring a huge university crowd, the entire area is peppered with numerous clubs and pubs where you can break a leg with the incredibly well-dressed youth of Korea. One of the best party places to visit in Seoul, expect a K-pop performance to break out anytime, a choir may begin singing, or an unknown musician might just announce themselves at anytime. If a cheap club is what you’re after, head to GOGOS. But if you prefer to be in a curated crowd, Club Vera is a fantastic choice. Once an unknown waterway in downtown Seoul, the stream was reconstructed in 2005 into a beautiful stream buzzing with life. Running close to 11 km through the city, a long walk in the evening along its urban banks brings the best of Seoul to you. The waterfront areas witness a lot of cultural performances and art installations regularly to keep one entertained. The evening lighting, the mini waterfalls, the twenty plus bridges that come through its course, all add to the charm of this urban wonder which many other cities across the world are looking to replicate. If you like skincare products, add a cosmetic shopping spree to your list of places to visit in Seoul. From moisturizing face packs to conditioning creams, Korea produces special products for skin care that are rarely available anywhere else in the world. Korean brands like Innisfree, Nature Republic sell their finest products across the city and specifically in the shopping mecca of Myeongdong. Try out free samples, avail huge discounts on group packs, and stock up enough beauty products for a year – all at an affordable price. ARITAUM is among the pick of all the beauty stores in Myeongdong, for budget shopping. There’s no way this wouldn’t be on the list of places to visit in Seoul. Darye, the Korean tea ceremony, is an etiquette of having tea that has been practised in Korea for over a thousand years. In the neighbourhood of Insadong, travellers can take part in the ceremony and enjoy a well-brewed cup of tea at traditional teahouses. Begin with Jidaebang tea house where the lotus tea will set you up for a perfect evening. Head to Dawon after, which is located in the compound of the Museum of fine art in a garden setting. This is the ideal place to unwind while sipping on their signature jujube tea, served with traditional rice cakes making for a beautiful combination of flavors. 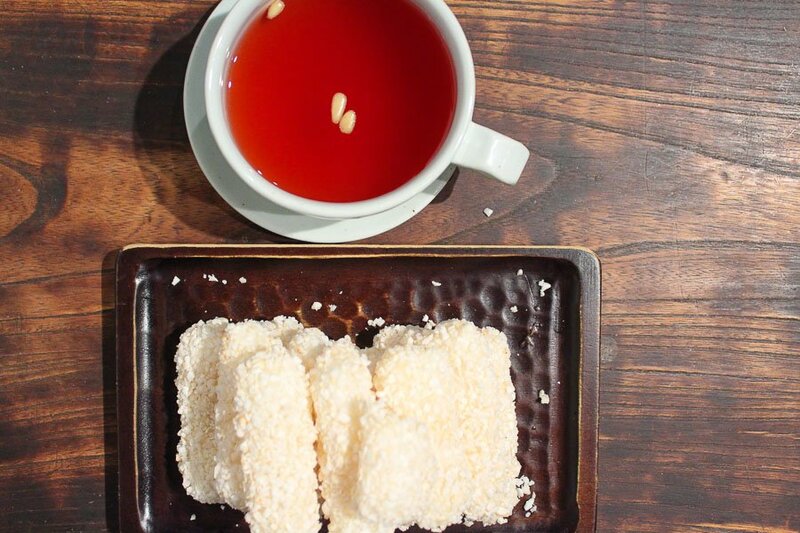 Those fluffy rice cakes and soothing jujube tea is a hit. Seriously! Samgyetang (chicken soup) is a summer dish in Korea consisting of a possum (baby chicken) stuffed with rice, jujube, garlic, and ginseng (a medicinal root used in Korea). While the idea of a possum stuffed with ingredients might not seem appetizing, it is among Korea’s most celebrated and delicious dishes that is a must-have while in Seoul. Tosokchon is an institution for samgyetang that’s incredibly tourist-friendly and serving authentic chicken soup since the 1950s. 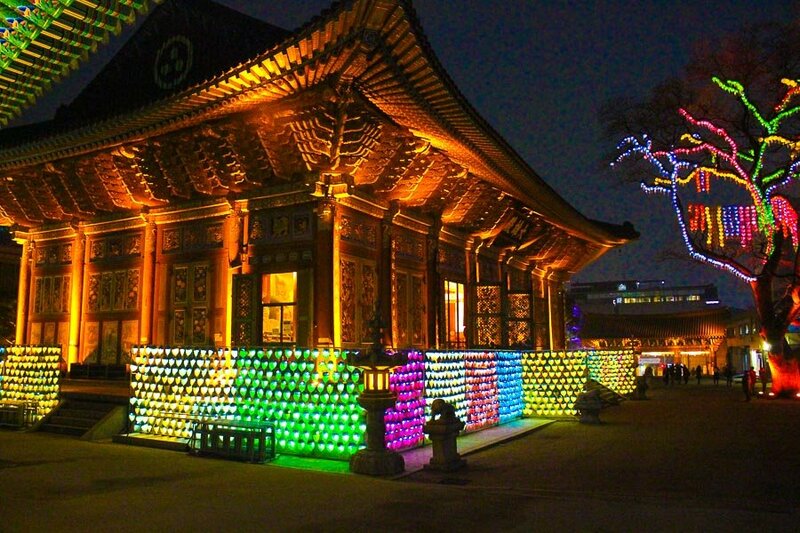 It’s also located close to Gyeongbokgung palace making it an ideal lunch spot after a visit to the palace. Going out for a classic barbecue meal is one of the better ways to socialize in Seoul. Locally called galbi, you sit around a table with a personal grill and barbecue a wide variety of proteins and vegetables, which is then devoured with a host of sides and washed down with beers. Itaewon is Seoul’s premier BBQ destination along with a large choice of Arabian restaurants to select from. Maple Tree House is incredibly popular among travellers, thanks to the English-speaking staff and menu, while Two Plus Itaewon is another top choice, especially among beef lovers. For foodies, this is one of the top places to visit in Seoul. Think of any Korean product / grocery item you’ve ever heard of, it’s almost guaranteed that you’ll find it at the Lotte Mart stores across Seoul. Processed goods, household items, cosmetics, ice creams, electronics, children’s products, fashion accessories, clothes, and much more is available for purchase. Supermarkets are often the best place to understand the lifestyle of the locals and trust us, Lotte is one of the most interesting places to visit in Seoul. The mart at Seoul station is extremely foreign-friendly with a few English-speaking store assistants to help you get along the aisles. There are few better ways to burn off the calories from the culinary expeditions in Seoul than a bicycle ride around the Han river. Rent a bicycle from the Yeouido Hangang park and do a 15 km loop passing the Mapo bridge, Jeoldusan Martyrs shrine, and the beautiful Seonyudo park. The park also has a resting spot to enjoy a cup of coffee while absorbing the river views. Return towards Yeouido, stopping by to admire views of the National Assembly and the marina. After the bike trip, you could also take a river cruise during sunset. After all that food you’ve been enjoying, this is one of the most apt places to visit in Seoul. Korea’s innovations are not limited to its cosmetic or technology but are also visible in its quirky and cool cafes. If the same leafy themed cappuccinos have begun to bore you, Seoul is the place to embrace thematic cafes that range from poop and cats, to dogs and racoons. While these cafes are lined all over town from Gangnam to Yongsan-gu, a large number of cafes are situated in the Mapo-gu district. Check out the “poop cafe” here – it’s one of the weirdest places in Korea! 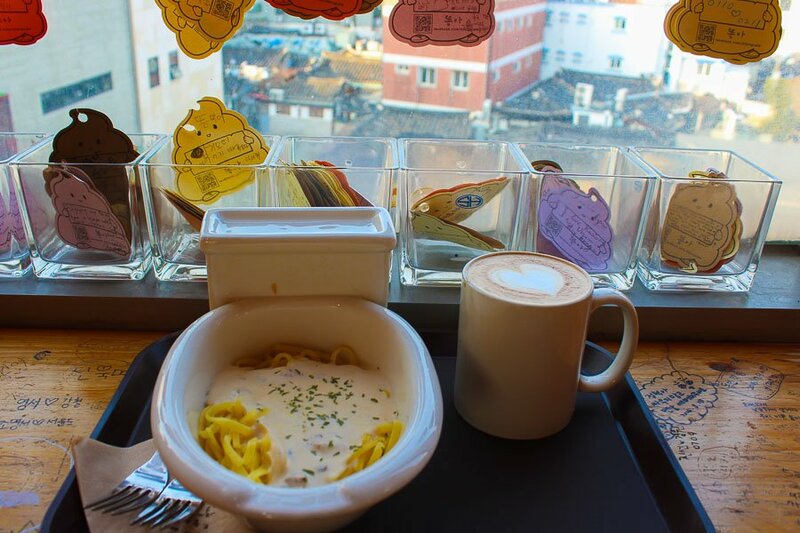 The quirky Poop Cafe serves its pasta in a miniature toilet. The transport system in Seoul is worth admiring, especially the subway system. Connecting every remote corner of the city and large areas in the outskirts, it’s among the world’s most advanced and efficient metro systems. But, the reason why it’s among the list of places to visit in Seoul is due to the numerous shops in the subway stations. This is the top place to shop for those on a budget. From winter wear and fashion accessories to freshly baked bread, you can find just about anything at the station stalls. Feel free to bargain your heart out! 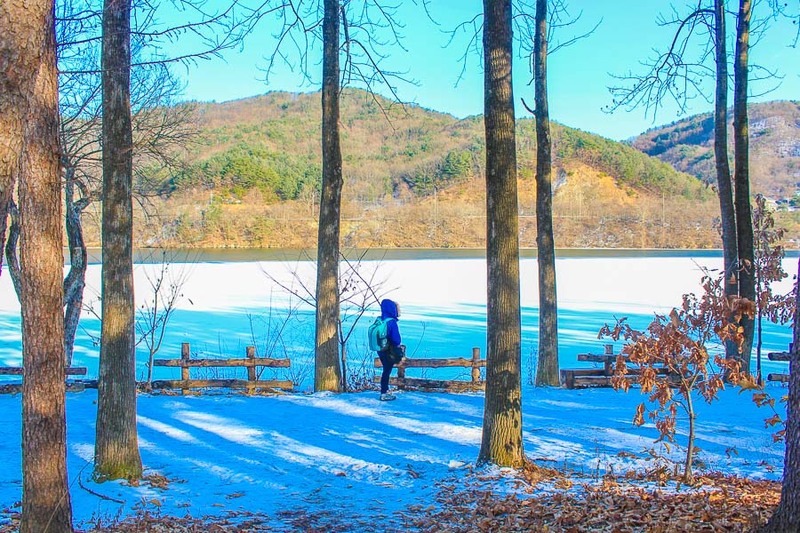 Whether you are a fan of Winter Sonata or not, Nami Island is one of the best places to visit in Seoul, especially in the winter months. Although this nature-filled place isn’t the best hiking in South Korea, and is thronged by tourists, it’s quite a cultural experience to watch the local travellers enjoy their weekends. During late winter, the lake at Nami freezes, making for a gorgeous view across the island. For those travelling with children, Nami island is highly recommended for its fun rides, zip wire, and large open spaces. When here, do not forget to eat Hotteok (sweet pancake). The queue is worth the deliciousness. Besides, if you love the book ‘The Little Prince’ as we do, you may also enjoy visiting Petite France, a village modelled after the book. Getting There: Take the metro to Yongsan station and catch the ITX train to Gapyeong from where you could take the shuttle bus to the ferry wharf and then ferry across. Or, if you’d prefer to have a pick-up and everything arranged for you, click here to learn about a Nami Island tour. Korean spa is not your ordinary hour-long relaxation massage. It’s a getaway from life! 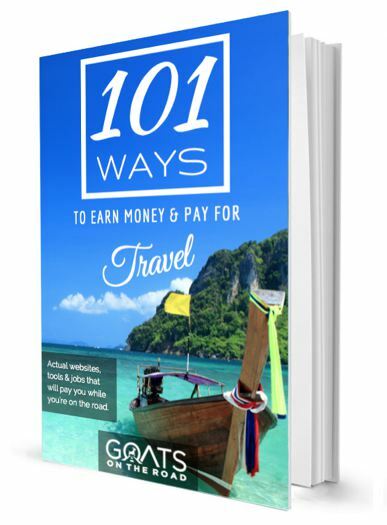 In a typical Korean Jimjilbang, you would be scrubbed, soaked in hot water, and most importantly be completely naked and surrounded by locals who would be doing just the same. Depending on the Jimjilbang you go to, there are facilities like hot water pools, sauna, massage, and even film rooms to sit back and relax. At some of the Jimjilbangs, you can stay overnight and save the night’s tariff at a hotel. Relaxation and accommodation, both in one go. Siloam and Dragon Hill Spa are two of the famous ones. 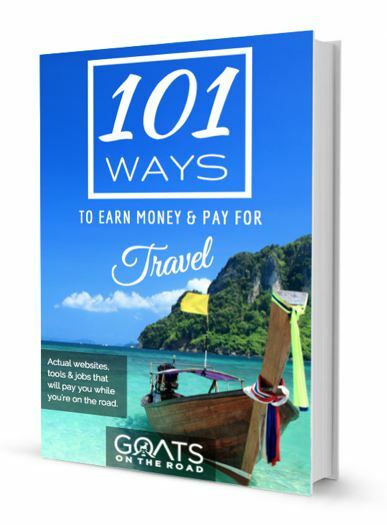 You can ask your host or hotel to suggest one that may be local to the area you stay in. 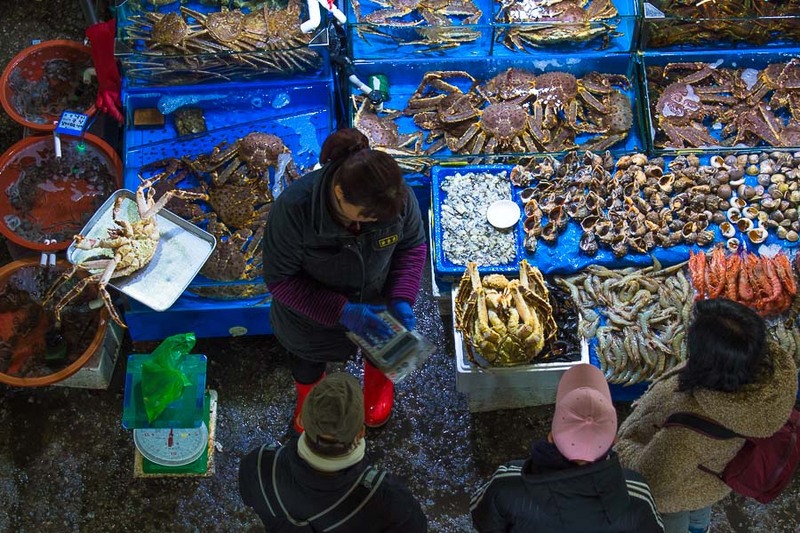 Name a sea creature and there’s a very high chance that you will find it in the vibrant fish market of Noryangjin. It’s where all the restaurants in Seoul source their fish from. I must warn you though that if you prefer to eat your food without seeing it being chopped and butchered, the market may not be for you. The fast pace negotiations, a variety of seafood, and the chitter-chatter filling the market is worth the experience, this is one of the most local places to visit in Seoul. Get here early morning to watch locals trade, though an evening tour isn’t too bad either. Koreans love murals – you’ll find them in quite a few places around the country. In the Ihwa Mural Village, there’s an entire neighbourhood painted with trendy art and colorful walls. Set up on a hillside, the Ihwa Mural Village was an attempt to decorate and restore the community neighbourhood. However, there are contradictory views to the restoration and not all the residents appreciate the attempt, and it’s important to keep this in mind as you walk through the village. Wear comfortable shoes and attire and carry enough drinking water – the walk around the village is almost a mini hike. If you were to pick just one of the places to visit in Seoul, make it this one. There’s no better way to start your South Korean journey than a slow walk in and around the Gyeongbokgung Palace. 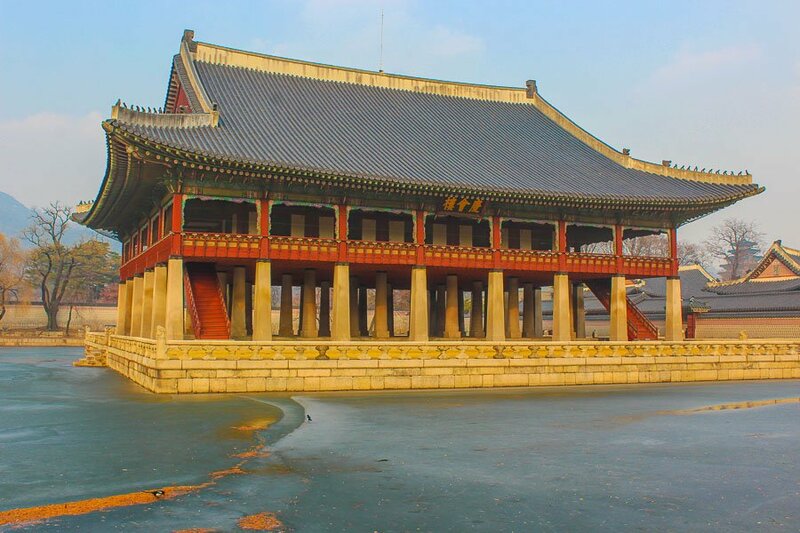 The largest of the five palaces in the city, the North Palace (Gyeongbokgung Palace) is a great introduction to the history of the Joseon dynasty. Arrive at the palace early in the morning (starting time is 9 AM) to avoid the crowds. For just 3,000 won ($2.70) per person, you can enjoy the magnificent palace and its large open grounds. For photography lovers, the palace with a view of the Bukhansan mountains in the backdrop makes for a great frame. The 623 years old Gyeongbokgung Palace. Seoul is surrounded on all sides by mountains and peaks that are perfect for hiking. A popular weekend activity among the youth of the city is to hike up the Bukhansan mountains, which holds the dubious record for most hikers per square foot. Beginning at the Bukhansanseong Fortress, the trail to the highest peak of Baegundae includes walking along fortress walls, Buddha statues, and local temples. The view from the top is stunning and well worth the 5-hour climb. 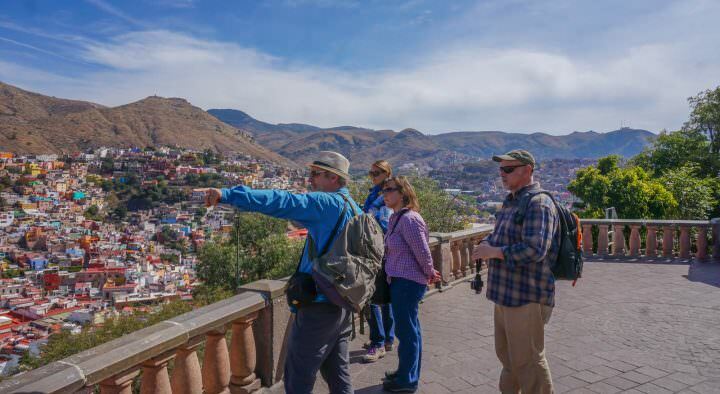 We recommend doing the hike early in the morning on a weekday, to avoid the crowds. The ‘Nanta Cooking’ show that originally premiered in 1997 follows the story of three cooks working hard to cook a lavish wedding banquet on a strict timeline. The musical that takes place across the two theatres in Hongdae and Myeongdong is entirely non-verbal with the story told through magic tricks, acrobatics, comedy, and audience involvement. Strung together through the unifying element of samulnori music (music created using objects), it’s an incredible performance. There are three shows a day in both the theatres and costs around $35 a ticket. Click here to book your tickets and enjoy the show. South Korea has a strong Buddhist influence and the gorgeous Jogyesa temple is a testament to it. Built in 1395, Jogyesa temple is the centre of Korean Buddhism (Jogye order). The temple is peaceful in the mornings but if you would like to see it lit up, evenings are the best time to visit. It’s best to read about the temple’s history in advance and understand its significance to make the most of this experience. To explore the Korean Buddhist principles in depth, choose the temple stay program offered for free at the temple itself. 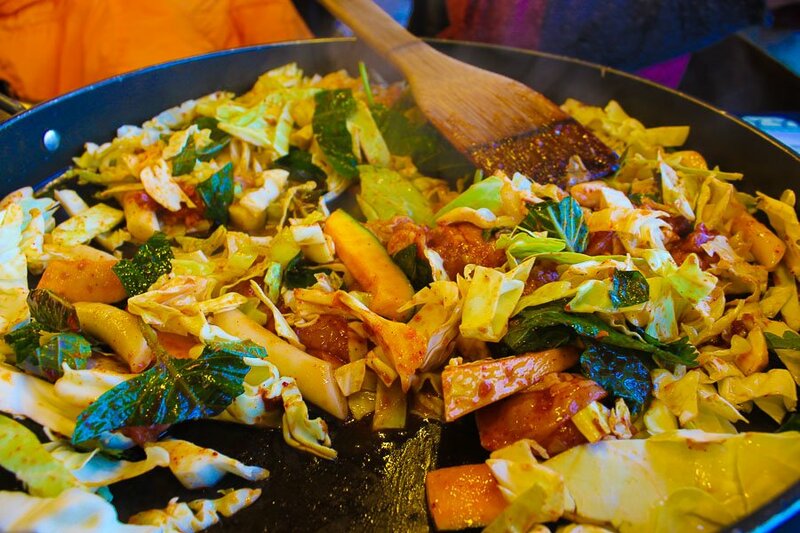 Vegetarian Buddhist meals, teachings, and an overall introduction to Jogye make the stay experience absolutely unique. The center of Korean Buddhism, Jogyesa Temple, is truly peaceful. Perched on a small hill in the heart of Seoul, the traditional Bukchon village is like traveling back in time. Hanoks, traditional Korean houses as old as 600 years line the alleyways that meander through the walls of Changgyeonggung palace. For those not traveling to Jeonju, staying in the minimalistic Hanok in Seoul is an equally fascinating experience. Wear a hanbok and amble around the streets admiring beautiful street art, clicking Insta-worthy pictures, digging into local food, and shopping for the souvenirs to carry back with you. 21. Chicken In The Kitchen – For…Chicken! It’s Seoul, so the list must end with food, right?! And what better than the dish no one does better, not even the Colonel – Chicken. 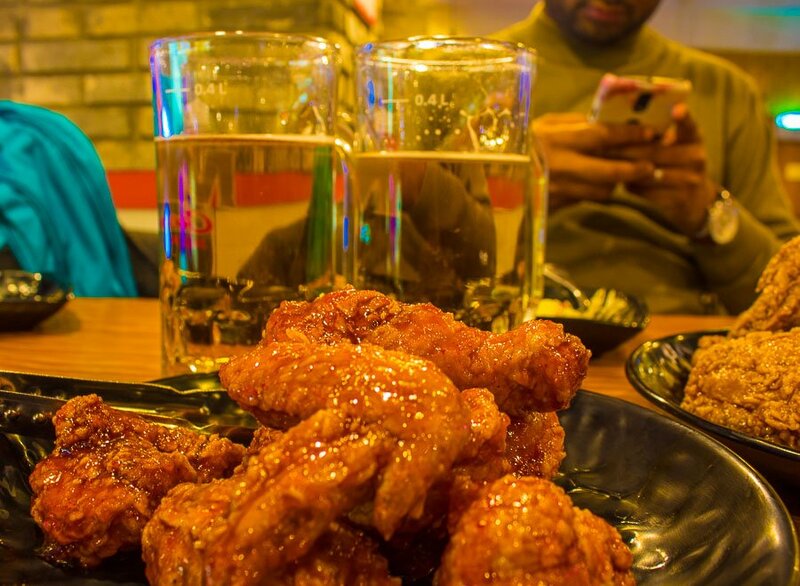 Koreans love their chicken so much that they have a nickname for having fried chicken with beer called ‘chi-maek’ which just simply means having chicken with beer along with your friends. This is some of the best Korean food! Although there are numerous joints all across town, Chicken in The Kitchen is one which is known for its impeccable hygienic practices and well suited for a romantic evening (even though you’ll be dipping your hands into the juicy sauces). Of all the places to visit in Seoul, this one has to be our favourite. The best pair of all -Chimaek! 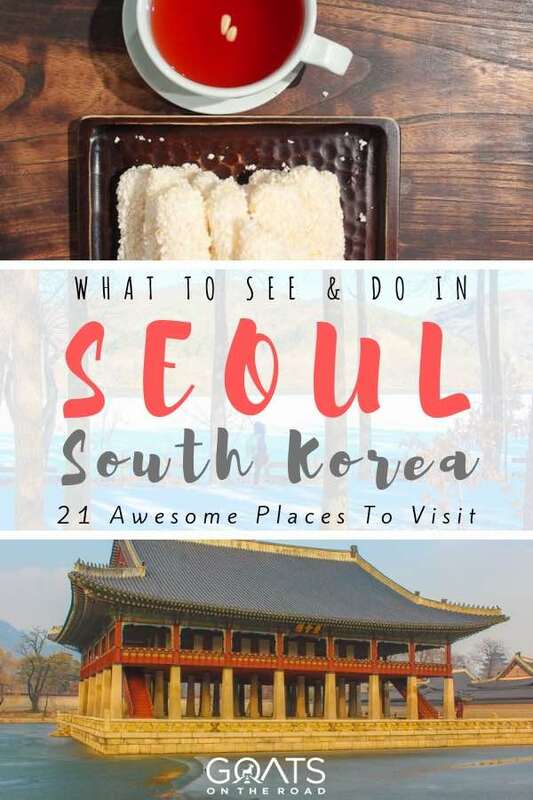 Ready For The Amazing Places To Visit In Seoul?! Seoul is a city that needs time. 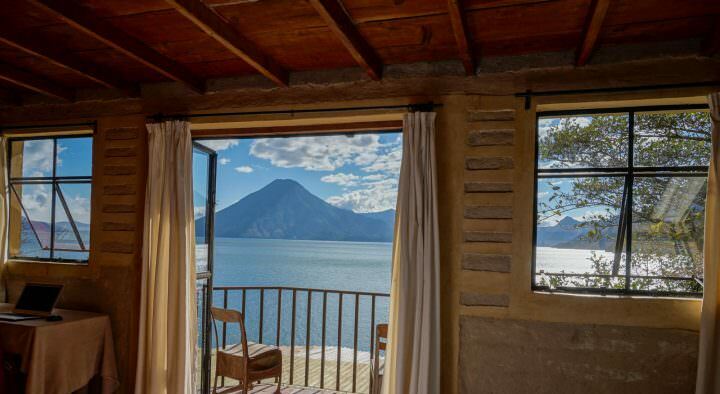 With so many unique things to see and do, the longer you stay here, the more you’ll find. 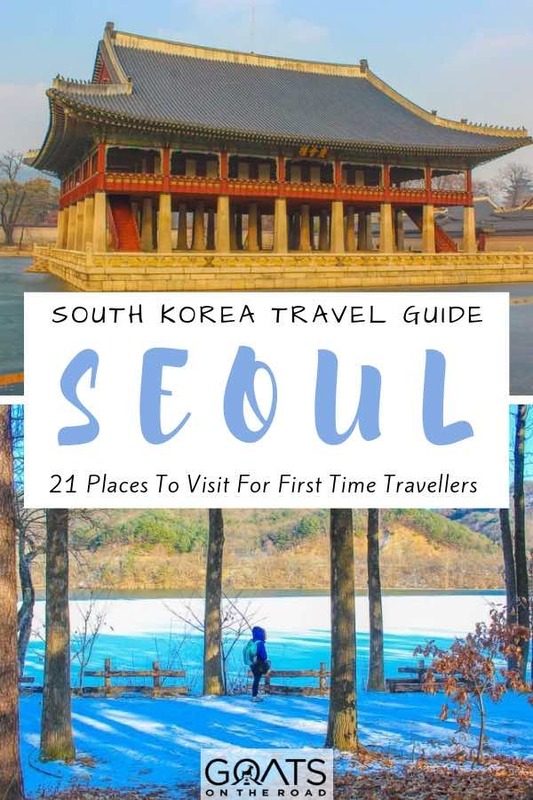 Whether you’re into nature, architecture, history, food or culture, Seoul has something for you. 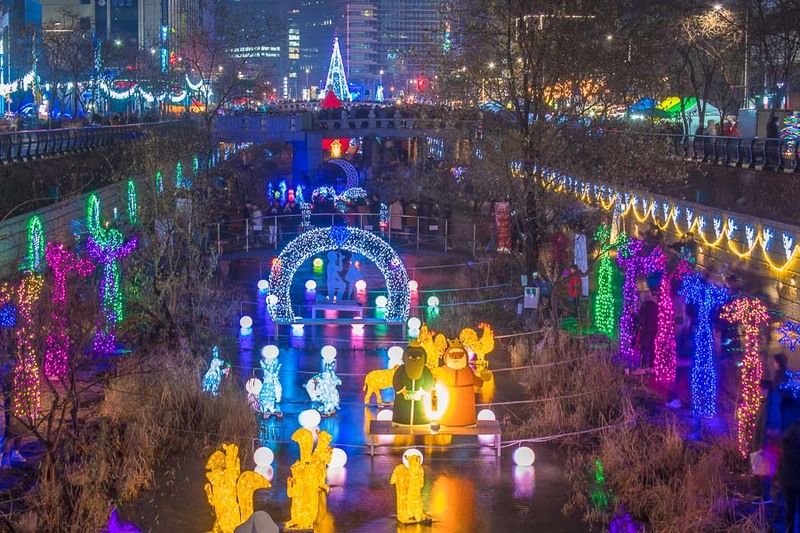 The country of South Korea as a whole has a lot to offer travellers, we visited during the lesser crowded winter season and experienced a different side of the country. Read more about our winter experience in South Korea here. Seoul is an amusing city to visit, thank you for collecting some suggestions to do. The pictures are gorgeous.